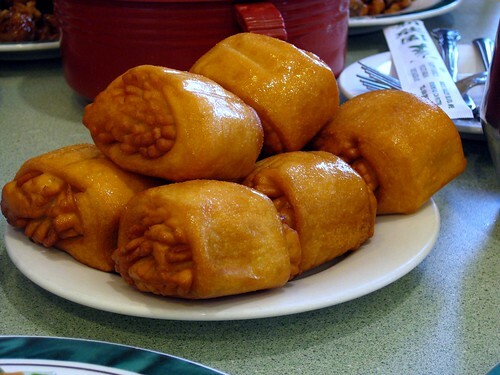 If you've never been to a Chinese vegetarian restaurant, prepare to be amused. New Happy Family (8632 Valley Blvd., Rosemead) is a good place for your introduction to the world of tofu, bean curd, and gluten. I can hear some of you scratching your heads through the screen. 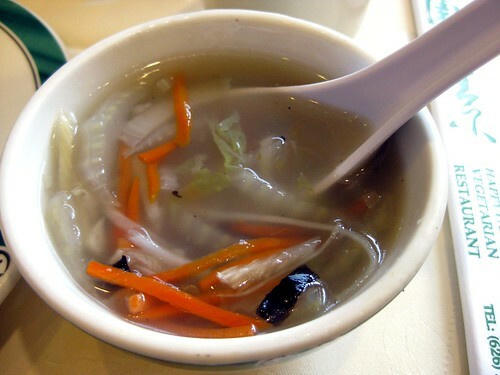 Chinese vegetarian restaurants do not serve merely vegetables. 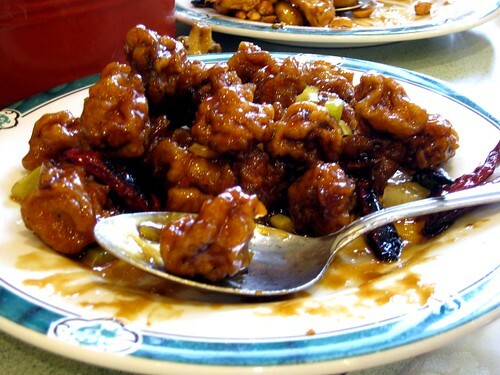 They make fake meat from all sorts of gluten and soy products, so you can order kung pao "chicken" and shredded "pork." But nothing is actually meat. Get it? As you know, I love meat. Recent restaurant visits like this one and this one more than prove it, but I love vegetables and tofu, too. 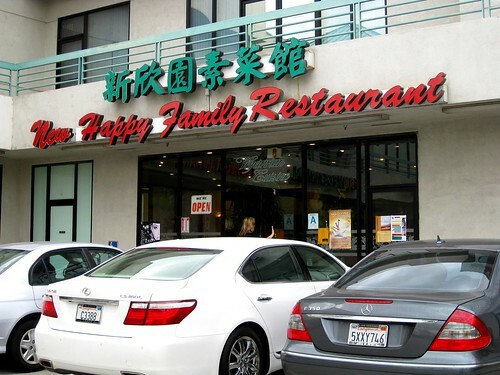 I really enjoyed my meal at New Happy Family. It was light and delicious and a particularly good deal for lunch -- midday specials range from $4.75 to $5.75 and come with rice and fried mantou. Kind of the perfect thing to eat a couple days before gorging on Thanksgiving! Complimentary soup. 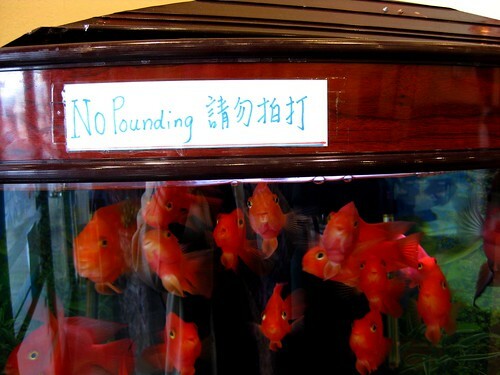 Neither outstanding nor offensive. 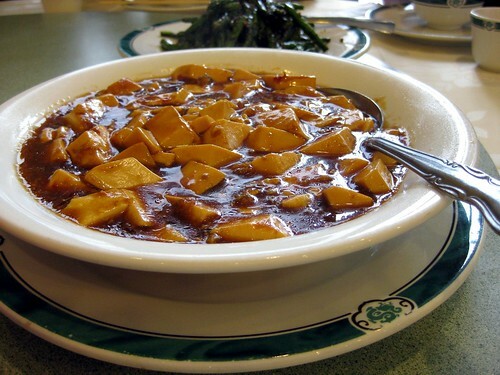 Mapo tofu ($4.75). It needed more spice, and it wasn't as good as Mama Monkey's mapo tofu. Any mapo tofu, however, is tasty regardless. 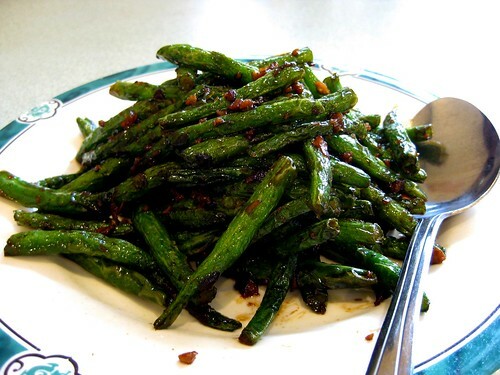 Dry sauteed string beans ($4.75). Yummy. Always. Buddha's Feast ($4.75). Very fresh and good for you. Fried mantou. I love this fried bread so so so much. You must eat these. 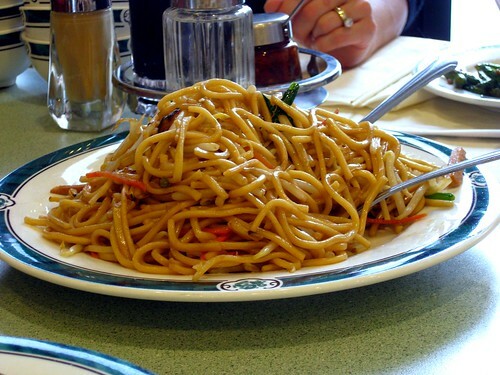 Chow mein. Bland. Meh. Skip. 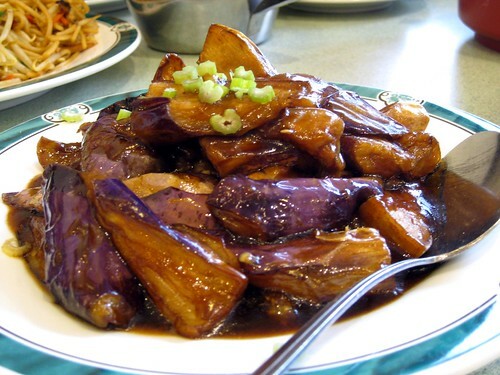 Eggplant with brown sauce ($4.75). Fantastic. A must-order. 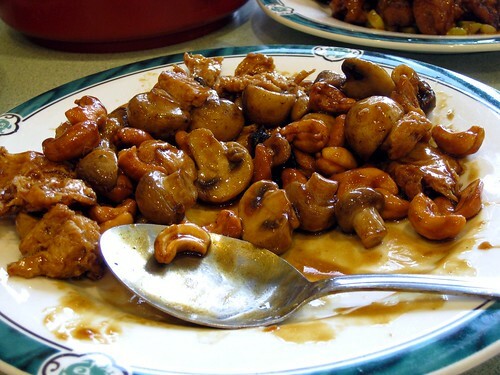 "Chicken" with cashews ($5.25). Decent. I could take it or leave it. Deep fried house "chicken" ($5.25). Our server recommended this, and boy were we glad. This was my favorite dish of the day. 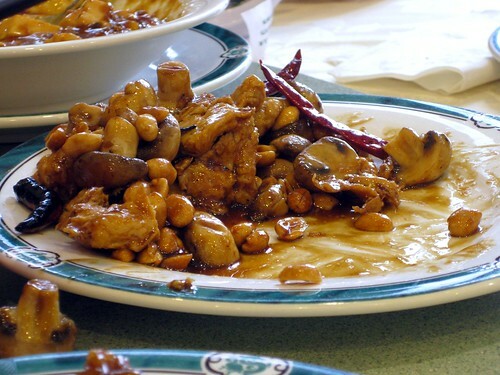 Kung pao "chicken" ($5.25). Pretty close to the real thing. For those of you who don't eat meat or who observe Lent, this restaurant should totally become part of your eating repertoire. OMG! I so wish this was closer to me!! I am grinning like an idiot at all of the vegetarian yumminess!! Totally spastic over the fact that if I ate here I would nto have to ask questions like " But is it cooked in a meat broth?" YAY! Right up my alley (if the alley were actually 1,500 miles to the east)! yeah, the "meat" at those restaurants is actually pretty good. and i'm no tofu eater! "Chow mein. Bland. Meh. Skip." <3 you. 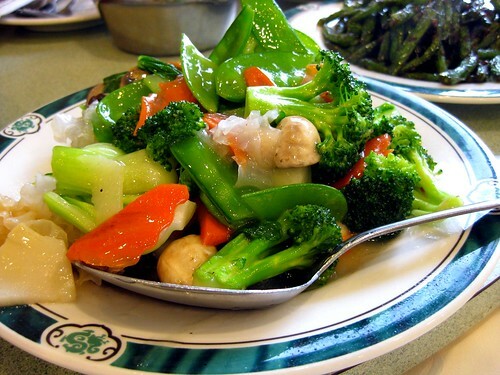 have never tried chinese vegetarian. not usually a fan of fauxmeats b/c of bad experiences with seitan and such. Aw, we used to eat at these meatless restaurants when i was in college (in Claremont). Miss California! 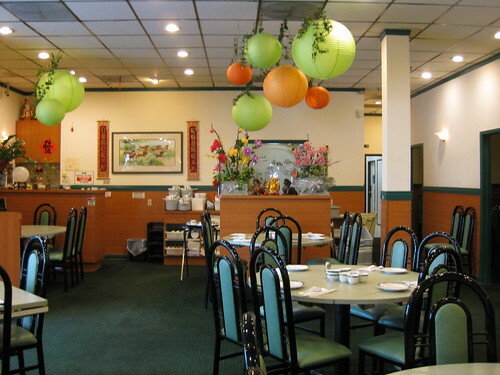 There was a Chinese vegetarian restaurant by my parent's old house. It was phenomenal. The faux shrimp is my favorite. You had me at "fried bread." I think I actually went here once. I missed out on the fried bread though; must go back! I've got to try a place like this before I make a final decision about whether or not I like tofu. Very cool. I can't wait for Lent next year now!!! Some of those dishes sounded amazing. See--I would have been great until the fake chicken was served. 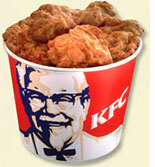 It just seems wrong to call something chicken that isn't really! It's a beautiful concept for veggies/vegans, though.